The Instituto Centroamericano de Administración Pública (ICAP), based at San José, Costa Rica, is an international, governmental organism, self-styled "an institution in the service of public administration and integration in Central America". Created in 1954 by the governments of Guatemala, El Salvador, Honduras, Nicaragua and Costa Rica as the Escuela Superior de Administración Pública en América Central (ESAPAC, High School of Public Administration in Central America), the ICAP took its current name in 1967 (convention signed on 17 February 1967 in San José, Costa Rica, http://www.oas.org/juridico/spanish/firmas/f-79.html). Panamá joined the ICAP in 1961. The ICAP is ruled by a General Board made of the Ministers of Economy of the participating countries. to promote the process of integration in Central America. 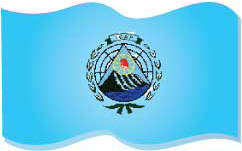 The flag of ICAP is celeste blue with the emblem of the ICAP in the middle. The flag recalls the principles of honesty, transparency, knowledge and ethics required in the public service and in the institute. The celeste colour represents the principle of compromise and the search for cooperation, conciliation and agreement between the countries of the region. The emblem of the ICAP symbolizes the principle of integrationist aspiration of the region, emphasized by the set up of republics in the XIXth century. It alludes to the principles of equality, fraternity, liberty, republicanism, progress and peace. It includes elements from the emblem of each country of the region. The equilateral triangle represents with its three equal sides the equality in rights and duties of the countries to decide of their future. The group of five volcanoes surrounded by a sea and an ocean represents not only the morphologic and geographic characteristics of the isthmus but recalls also the historic process of evolution of the territory. The sun represents the strength of light and the hope of the new dawn. The Phrygian cap symbolized the struggle for liberty and republicanism. Emblem of the formation of the French Republic, it represents the recognition of the Central American countries as free and sovereign republics. The representation of the world as a "wheel" evokes the integration into the concert of the nations. Two branches of olive symbolize knowledge, growth and respect of the right to peace, shared by the peoples and the states. The knot in the ribbon represents fraternity and solidarity among the Central American countries. The sky represents truth, serenity, sincerity and responsibility in the everyday's life.